Continuing with the Sculpture Vulture focus on famous Arkansans during Arkansas Heritage Month, today’s feature is George Rose Smith. 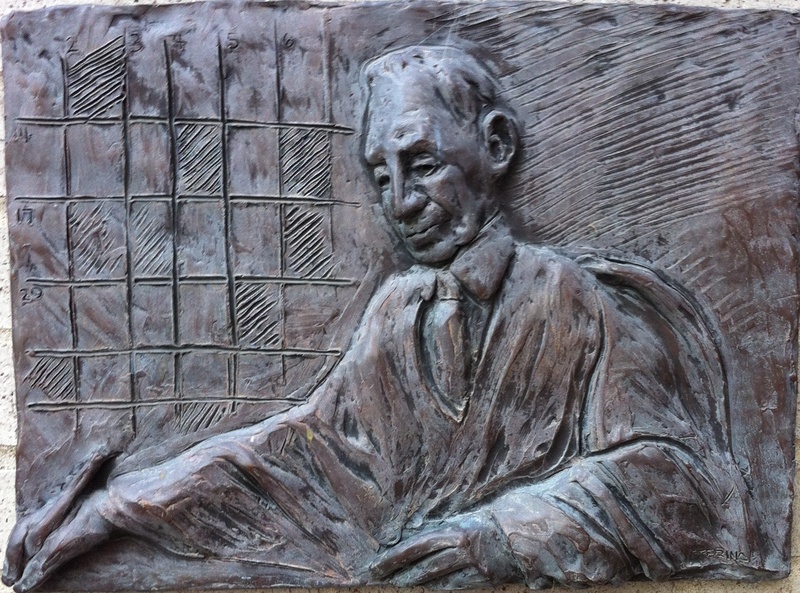 This sculptural plaque is located in the garden at the main building of the Central Arkansas Library System downtown campus. Created by John Deering, it showcases Justice Smith sitting in his judges robe with pen in hand. In the background is a large crossword puzzle grid. This sculpture pays homage to the fact that Justice Smith was both a respected member of the bar as well as an author of crossword puzzles. In his final opinion from the Arkansas Supreme Court before he retired, he embedded a message using the first letter of each paragraph to spell out his farewell. A masterful puzzle constructor, he authored puzzles which appeared in The New York Times. Little Rock District Judge Vic Fleming carries on this tradition of being a published puzzle author as well as judge in Arkansas. Justice Smith was the scion of a family of Arkansas attorneys. His grandfather Uriah Rose, a longtime partner at the law firm which now bears his name, was a delegate to the Hague.